The game of foosball, which is modeled after soccer, is trendy and has been around for quite some time. 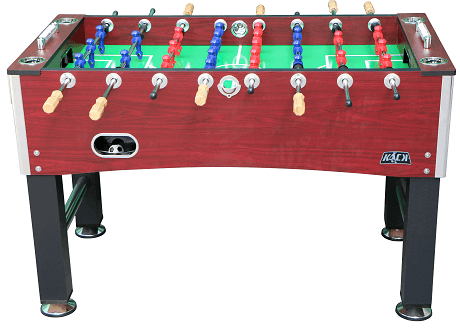 The Kick Foosball Table is an old-fashioned style table which has been upgraded in quality from the previous model. This is a quality table which is known for its excellent performance and enhanced stability. A foosball table is a wonderful addition to your home and is a recreational item which can be enjoyed by players of any age. 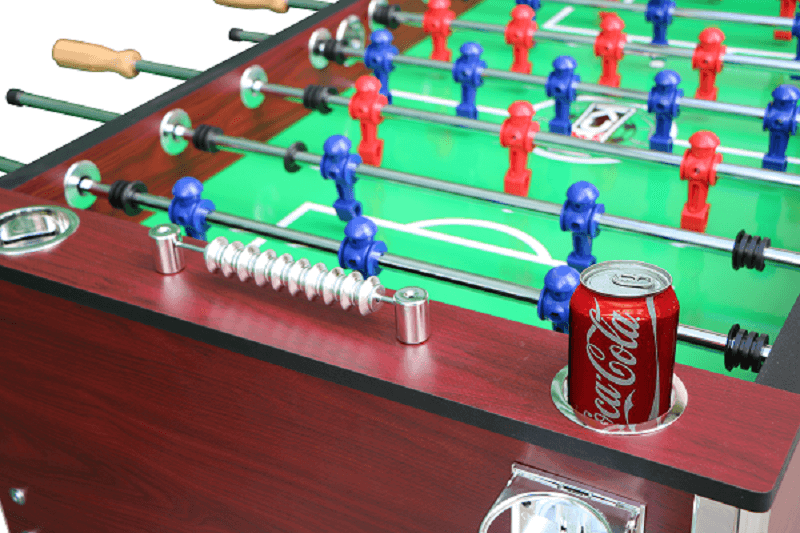 The Kick Foosball Table can fit in virtually any decent sized room in your home. The foosball table provides excellent value in that it will give you many hours of enjoyment for you, your family and friends. This is certainly a well-designed product with an affordable price tag. The beauty of foosball is not only that it models itself after the beautiful game of soccer. Although there is a considerable amount of strategy involved, it also requires sharp reflexes, good hand-eye coordination and quick reaction time. Continuous play keeps your skills sharp and your mind adequately exercised. This foosball table from KICK is an excellent option for more serious players who want quality without going over a certain price point. 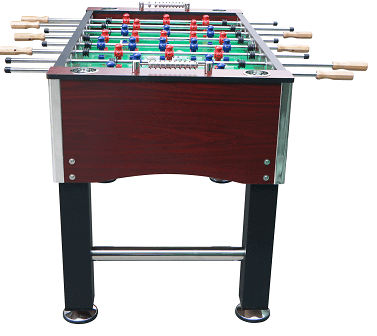 The first thing you are sure to notice about the Kick Foosball Table is its eye-catching design and looks, which gives the impression that this table is a lot more expensive than it is. The lavish wood design and dark grey legs provide a stylish look which is sure to enhance the decor of any room. The immensely appealing classically inspired design will make you the envy of all. 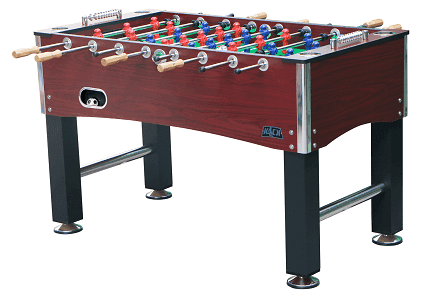 Not only does the Kick Foosball Table have everything going for it in the looks department, but it is also an extremely durable unit made from quality wood and other excellent materials. Its stable structure contributes to its flawless gameplay and ensures you will have a top-notch fully functioning quality foosball table for a long time to come. This foosball table utilizes premium parts in its construction, and you can feel the difference when playing. One of the noted advantages of this item is that you can play on uneven surfaces by utilizing the leg levelers. This feature really stands out, since you are not reliant on a perfectly level floor for an optimum gaming experience. One thing which you quickly notice when playing on the Kick Foosball Table is the smooth gameplay, which is a direct result of the quality of the product. Quite a bit of attention has been given to important details when constructing this product. From the solid and sturdy legs to the durable stainless steel chrome plated rods to the counterbalanced players, no stone has been left unturned in the design of this item. With its precision player control, superbly balanced soccer field and comfortable dribbling foosball players, this table will deliver a memorable and superior gaming experience. The no-slip wooden handles and premium bearings will ensure smooth gameplay where skillful play will make the difference. As a result of its superior construction, time after time, you will be guaranteed a quality game when utilizing the Kick Foosball Table. The gaming experience can be very fickle, and this table ensures you will never be left disappointed every single time you play. Of course, it may not help you play better, but it will provide you with the quality apparatus to play your best. Of course, the Kick Foosball Table is not just another game; it is also a piece of apparatus which will add value to your game room or any other room in your home. It has an elegant wooden design which should blend in seamlessly with almost any decor. This is certainly not a gaming piece which will stand out like a sore thumb. Since a certain amount of room is required to play foosball, you will have to make sure that it fits within the confines of your room. It is 55 inches long by 30 inches wide. These are the key dimensions when determining fit. Unfortunately, the Kick Foosball Table does not come to your home assembled and ready to play. There has been some criticism leveled at the assembly instructions, which may be somewhat difficult to follow. However, if you are having issues, there are videos which you can view that show you how to properly assemble this unit. Also, it would be a good idea to recruit the assistance of several other individuals when putting together the table. Due to its size, you will need help in holding some of the parts while they are fastened into place. Most reviews for the KICK Royalton are positive, as they highlight the quality of its construction. While there are some negative reviews about experiences with customer service, they are not common enough to demonstrate a negative trend. While this is a quality foosball table, you will have to be ready to pay for that improved construction. The KICK Royalton usually sells for around 600 dollars. When it comes to sheer entertainment value for you and your family, it is unlikely that you can make a much better decision than the Kick Foosball Table. Manufactured by an experienced company, this premium quality 55-inch table is designed to give you numerous hours of enjoyment. It is a sturdy and durable unit which enhances your gameplay. In addition to its gaming value, this elegant looking table with retro, old-school design will look magnificent in your home. It has an aesthetically appealing wood design which will blend in seamlessly and enhance the decor of most homes. If you’re ready for some foosball, and then some, the Kick Table is an excellent investment which should have you enjoying the game for a long time to come.